Oh, how I love fall! It is my favorite time of year (next to Christmas). We don’t get to experience fall here in Florida so I am going to pretend we do by cooking up some fall deliciousness and decorating the house with fall decor! 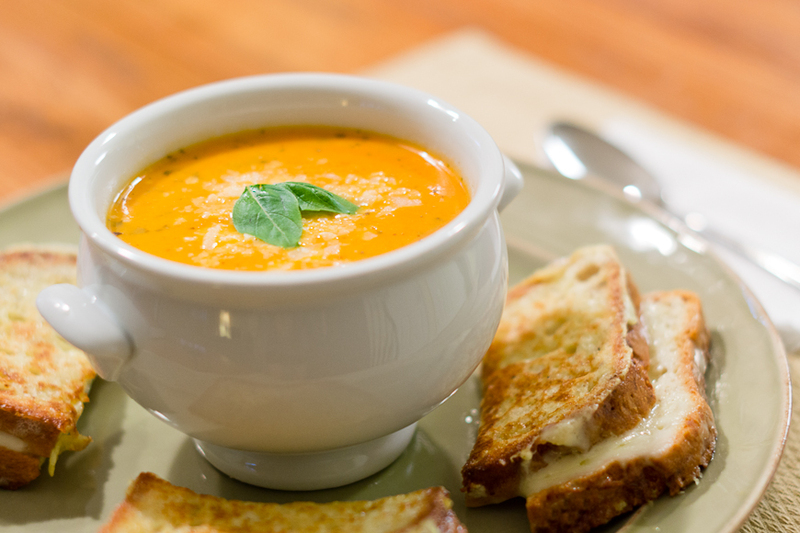 First up, this hearty Cream of Tomato Soup with Basil and fancy mozzarella grilled cheese. Mmmm this did not disappoint. Luke and I stuffed ourselves to the brim. It began pouring rain this evening and turned out to be the perfect day for soup. Nothing like soup on a rainy day. Now I am about to snuggle up on the couch while my husband serenades me on the piano. Hello, Friday! This is my first time making tomato soup from scratch. I have no idea why it turned out orange…do you? I was going to make a simple Cream of Tomato soup and began following a recipe but soon decided to change my plans and add some fresh basil from our herb garden we just planted. I plan on trying lots of different versions of this all fall long! It’s perfect with grilled cheese. My favorite gluten free bread is Udi’s Whole Grain Bread. It is in wide circulation so you can probably find it in your local grocery store…if not, you can buy it online. Melt the butter in a large pot, sauté the onion and garlic over low heat for 5 minutes. Add the tomatoes and cook for 15 minutes, stirring occasionally. Season with salt and pepper to taste. Pour in three cups chicken broth and the diced potatoes. Bring to a boil. Lower the heat and simmer for one hour. Transfer to a food processor or large blender and process to a puree, then pour back into the pot. Reheat, then stir in the cream. Pour into a bowl and top with Parmesan and fresh basil to garnish. Note: If you have never peeled, seeded, and sliced tomatoes like me, I found this website to be very helpful! It worked like a charm. However, I found peeling and seeding the tomatoes to be pretty time consuming…might try a recipe that calls for something canned next time. Enjoy! I plan on posting about our new vegetable and herb garden soon!